While the arts flourished, the national economy, the social organism, the national spirit and potential sputtered and stalled. In the final century of the Golden Age (1600-1700) the kings of Spain became progressively worse. The reigns of the three Philips (Philip II, 1556-1598; Philip III, 1598-1621; Philip IV, 1621-1665) mark the progress of the Spanish art, and also the decline and the fall of the Spanish empire, which gradually became a hollow shell. Velázquez’s portraits of the hapless Hapsburg kings and their families reveal better than any words the inbred weakness of the line which by the time of the last king of that name, Charles II, had degenerated to the level of chronic disease and imbecility. Spain clearly had been left behind by the rest of Europe. Doggedly she had clung to her dream of a Catholic Europe; sternly she had maintained a Catholic Spain; inefficiently she had governed her empire overseas, and ineptly she had wasted her last resources on stupid battles, immoral philandering, and the building up of the most crowded priesthood on earth. The victorious soldier, no longer victorious, turned easily into a vagabond, a gambler, a bandit, or a priest. He became a parasite, not a producer. And this was the tragedy of his nation. Unable and unwilling to keep up with the times and the changing system of values by which men lived in Europe, Spain claimed they were no good, and clung tenaciously to her medieval past. Spaniards had less and less to eat, but still they boasted of their great empire, their rich culture, their zealous faith, and their incomparable individual worth. During the previous several centuries Castile, the great heartland, had asserted her dominion and had succeeded in unifying Spain. Castile was a land of great warriors; her war spirit was admirable, and it had led to the enforced unification of many diverse provinces. Separation in Catalonia and in the Basque provinces awakens and begins to stir with renewed vigor. Castile knew how to conquer, but she did not know how to govern. In 1609 Philip II, encouraged by his advisers, decided on the expulsion of the Moriscos. There were perhaps half a million of these people still in Spain. They were nominal Christians, but widespread reports of their following Moslem practices in secret had reached the court. Ships were brought and the Moriscos were loaded onto them under the eye of hundreds of Spanish troops. They were taken to North Africa and dumped there. Most of these people were agricultural or textile workers; the production of cotton, silk, paper, rice and many other products was mainly in their hands. So was nearly all of Spain’s irrigated farmland, which reverted to a desert when the Moriscos left. The decadence of Spanish industry and agriculture dates from the time of their expulsion. Spain appeared to be governed by a combination of fanaticisms: a loyalty to the kingship which eliminated constructive criticism, a superstitious credulity which attributed even the most obvious errors of agriculture, of economy, and of health to supernatural things (even when famines and epidemic of diseases hit Spain, the Spaniards, instead of studying the situation and applying the best knowledge of science, shrugged their shoulders and murmured that the will of God must be accepted), and an intransigence to change which kept the country inert while the rest of Europe was marching forward. Economic conditions were so bad in Spain that unemployment became a national scourge. Young men coming of work age could find nothing productive to do. The only security for them lay in entering the church, which attracted hundreds of thousands of them. In all this drab picture there was only one haven outside of the church: the Spanish New World. Even in those days America was still a land of promise. It continued to drain away many of the country’s most able workers. Thousands had gone and had found gold and slaves. However, there too economic conditions were often deplorable, and the priesthood became top-heavy. Yet it was in Madrid that the extravagant Spanish court held forth with its lavish etiquette and opulent display. The money that came into the king’s hands went through like sand. Debts were seldom paid on time, taxes were raised beyond all sensible limits. The kings kept looking to American silver to bail them out, but this wealth reached Seville only to be forwarded at once to some foreign banker. The fundamental weakness of Spain as a colonial power, and the ascendency of British, Dutch, and French imperialism over her, lay in the backward and intransigent nature of the Spanish political and social institution, in Spain’s static economy, in her religious intolerance carried over into the political sphere, in her general unwillingness to swim with the current of social changes, but most of all in the vastness of the problem which she undertook to handle. When Charles II came to the throne in 1676, everything was lost. He had not the ghost of a chance to redeem Spain from the wretchedness. Every hope had fled. The dream was dead. Still, with that stubborn Spanish pertinacity which clings even more firmly to an idea that all others have abandoned as unworkable, the inhabitants of the peninsula held onto their outworn beliefs. Every law and governmental action seemed directed toward the concentration of power in the crown. The economic situation was so wretched, and the social classes were so neatly balanced one against the other that a state of national inertia resulted, followed by paralysis. 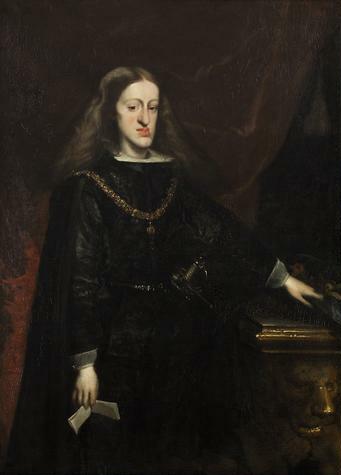 Philip IV had died in 1665 in the sixtieth year of his age, leaving his only son, Charles, a sickly child of four, as heir to the throne. When he was fifteen he took over the realm; he was in name absolute monarch of an empire of many millions of inhabitants and of vast territories. He was pushed and pulled about by his ministers and his advisers so that he rarely knew what was going on. In his final years he became a chronic invalid. He produced no heir to the throne. When he fell into his final illness in 1700 and knew that this was the end, he sought the counsel of the Pope as to the succession. The Pope stated that the French were the legitimate claimants to the crown. Charles II was distressed. He hated the French.